The owner of a waste carrier businessman has been fined £600 in Northampton Magistrates’ Court for fly-tipping offences committed last summer. 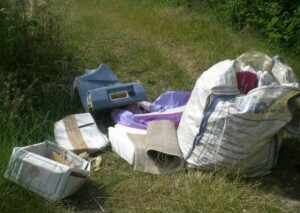 In summer last year, environment officers from East Northamptonshire Council were alerted to an area in Wadenhoe, where a number of fly-tipping incidents had taken place. Over the period of a few days, house and garden waste, including plumbing waste, had been repeatedly dumped in the same area. The unceremoniously deposited waste was traced back to residents who had hired licensed waste carrier, RJS Gardening Services, to dispose of their renovation rubbish. East Northamptonshire Council contacted RJS Gardening Services and the owner, Ryan Scott, told the council that he had hired the services of an unregistered waste removal man to dispose of the waste. This unlicensed waste carrier then fly-tipped the rubbish, including pipes, bathroom tiles, general waste and toys, in Aldwincle Road, Wadenhoe. East Northamptonshire Council had to organise the removal of the waste and cover the costs. Ryan Scott appeared in Northampton Magistrates’ Court on February 2 and pleaded guilty to failing to issue and produce waste transfer notes for the dumped waste. He was fined £600. Please click here for more information about our waste management services.